for those of you who want to display the ardupilot data on your tx lcd here is some more info. Neato Robotics XV-11 Lidar unit Hacked! My first attempt at communications was going to be I2C, with the ArduIMU as a writing master, and the Nano as a reading slave. I had hoped that the 5V nano would be OK with the 3.3V magnetometer, but COMMs were never achieved, and it seems to have damaged the mag. AMA membership mandatory in new regulations? The AMA is claiming that the FAA has "forced" them to become the "manager" of recreational aviation that will force every recreational sUAV user to be a member of the AMA or not be able to fly. As a total newbie into the world of electronics hardware and software, I took the big step a few months ago of deciding to build myself a UAV. Actually, I decided to build myself a quadcopter after seeing what was to become the ArduCopter on Hackaday, but the dream changed and the desire for payload carrying overcame my initial desires. first try to build an arducopter. 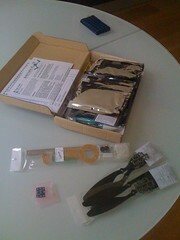 Just wanted to share my excitement about the arrival of my Arducopter. Hi, I'm wondering if there's a way to obtain AoA and sideslip angle information from GPS speed data? There is vertical speed and 3d speed so this would probably be able to give me an estimate of the angle of attack, but for sideslip, I would have to have the y-component of the speed. Is there a way to get this from GPS or the IMU unit? 3D Robotics What airframes are you flying with APM? I've been building both AutoPilots, and QuadraCopters, and I wanted to drive more servos and ESCs, with less jitter, so I used some ideas from the Paparazzi gang and developed a way to drive up to 10 servos with just 2 output pins from an Arduino or ATMega8.